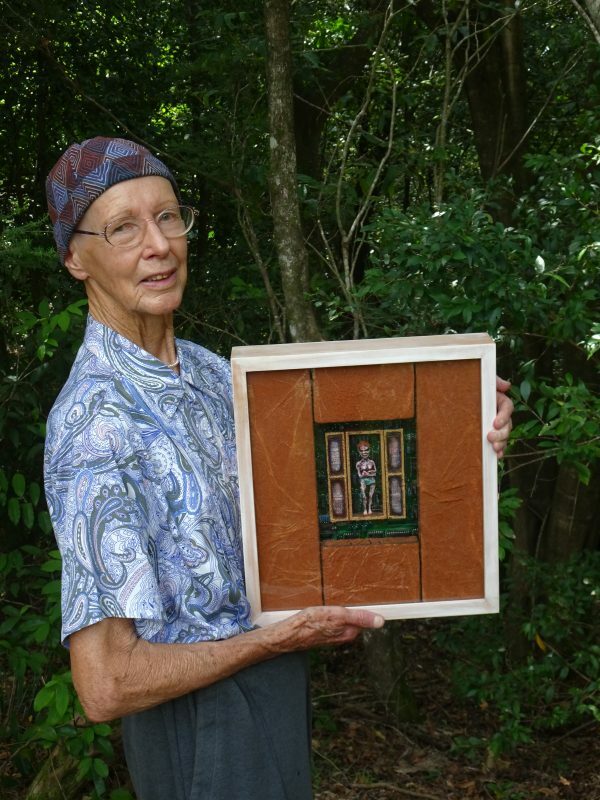 Adrianne Smith is a Montville artist who works in copper wire, creating tiny fantasies. She has a selection of pieces that she has very kindly offered to show at the April Markets in the Hall. She will be donating 50% of their sales to the Hall Deck Fund which the MVA is really excited about. So, when you are in the supper room, preparing to order your breakfast, have a look at Adrianne’s work. Perhaps you will find the something perfect for that space on the wall that you have been trying to fill for years! Adrianne says: ‘I have always enjoyed making models and painting. My father taught me carpentry on request in my childhood. Later education included an emphasis on biological sciences. I attended part-time life drawing classes to improve my skills in that area. I make the individual pieces of my scenery/figures/vegetation from copper wire. I build up these skeletons into realistic forms using tissue paper and glue. When dry and painted, I assemble them as desired to form small pageants or scenes to tell a story inside a small central box which I make from timber which my late husband prepared. When backed as desired, I screw this internal box to a ply backing, finished to enhance the internal scenery. I cut the outside frame with a mitre saw from prepared routed timber to produce a work that resembles a framed picture. I have the glass (or perspex) cut to size by a local art supplies outlet. The Montville Markets will be held on Saturday 13 April from 7.30am – midday.